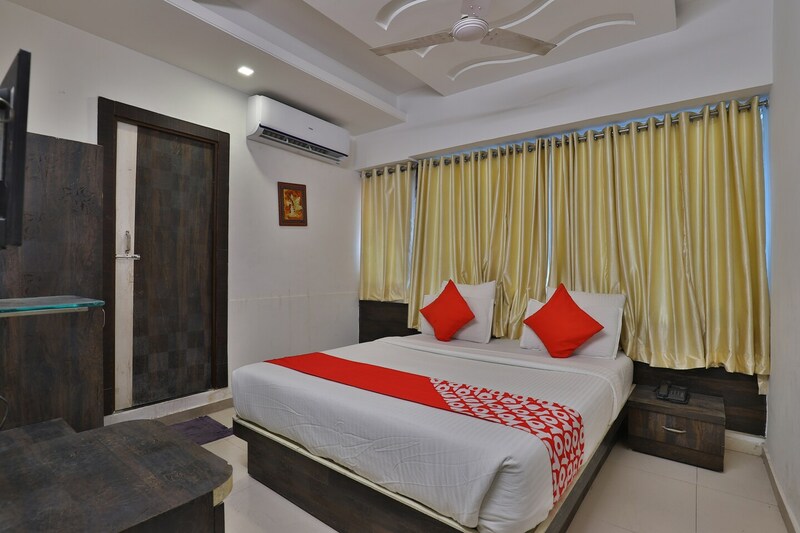 Avail the best of comforts and hospitality by staying at OYO Basic Chandkheda which aims at providing comfortable accommodation within the desired budget. Ahmedabad attracts corporates, students as well as leisure travellers throughout the year due to the presence of known companies, colleges and tourist attractions. During your visit to the city, check out the famous tourist attractions situated nearby such as Kankariya Lake, Sabarmati Ashram, Jama Mosque, Sidi Saiyyed Mosque, Teen Darwaza, Sardar Vallabhbhai Patel National Museum, ISKCON Temple and Ellis Bridge. Corporate travellers can easily reach out to the IT Hub of Ahmedabad with the help of public transport in the city. You shouldn't miss on gorging on the mouth-watering delicacies served at the nearby restaurants like Janaki, Karnawati Snacks, Mahavir Chorafali and Qwiches. You may take back souvenirs or gift items for your loved ones from the shopping centers nearby such as 4D Square Mall and Nehru Bazaar. Travelling around the city has become easier due to the availability of public transport. You may hire a cab or auto-rickshaw from the Sardar Vallabhbhai Patel International Airport or Ahmedabad Junction, depending on your convenience. OYO Basic Chandkheda offers distinguished services with the help of its well-trained staff. In-room amenities include a closet for your belongings and intercom for prompt service. The 24-hour helpdesk is there to assist you with fax or photocopier, wake-up call on request, fire extinguishers and first aid. Some of the quick getaway destinations from Ahmedabad include Gandhinagar, Nadiad and Bhavnagar.